KINGSPORT — A poor black woman named Henrietta Lacks, who died of cancer in 1951 at age 31, has helped medical research almost beyond measure. But she never knew about or gave permission for her contribution via a slice of tumor doctors took when she was a charity patient at Johns Hopkins Hospital in Maryland. It turned out that the cancer cells would double in 24 hours, making them the perfect vehicle for medical research. The HeLa cell line continues to replicate rather than die out after a short time, as other cells normally do. A 2010 book by Rebecca Skloot brought Lacks’ story to prominence, and a Science Hill High School student’s oration titled “The Mother of Modern Science” about Lacks won the 2019 Eastman Oratorical Contest, the finals of which were held Tuesday at the Black History Month Luncheon. However, Liang said she also did a lot of researching on the Internet while writing a paper in November, then polished it into a speech that made the top 15 of more than 160 entries from the region. The top five were presented live Tuesday at the luncheon in the Eastman Lodge on Bays Mountain. 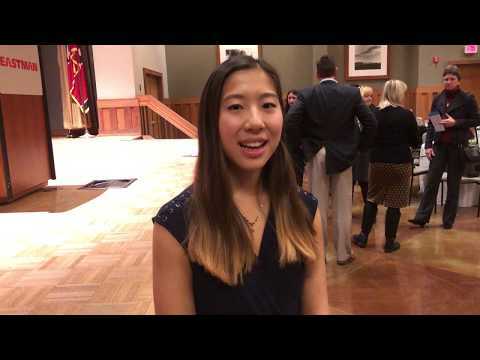 Liang, who won $1,000 for first place, said her “reach” school is the University of Pennsylvania, although she hasn’t decided to which colleges she will apply and whether she’ll continue her current interest in a business degree or try something else. This marks the second year a Science Hill student has won the competition, and the same teacher, KiKi Garman, taught both. Garman won a $100 gift card. Liang will present her speech at the Feb. 21 performance of “Black Angels Over Tuskegee Play,” an off-Broadway production. Bieger and Carter spoke about Neil deGrasse Tyson, an internationally known astrophysicist who has brought astronomy to the masses and famously declared that Pluto should not be considered a planet before the consensus was that it is a dwarf planet. Millwood spoke about the first black woman to be a ballerina for an internationally known program, and Higginbotham spoke about Ron McNair, who worked on the U.S. space shuttle program. McNair was one of 35 hopefuls who got a position among more than 10,000 applicants and the second black man in space. 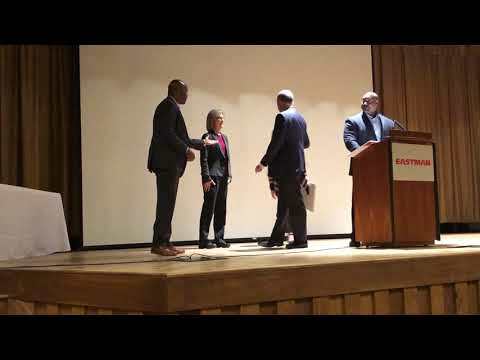 The event also honored African-American Eastman employees with 36 to 40 years of service.